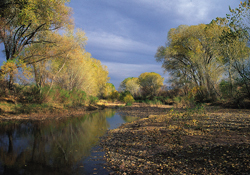 Flowing northward from Mexico into the Gila River, the San Pedro River is a biological gem beyond compare. It is the Southwest's largest undammed river. • Over 400 bird species, 100 butterfly species, 83 mammal species and 47 amphibian and reptile species are dependent on the San Pedro river. Nearly one half of all North American bird species frequent the San Pedro River at some point in their lives. • The San Pedro River supports the second highest number of mammal species in the world. This is second only to the montane forests of Costa Rica. • It is the principal recovery area for the endangered jaguar, Southwestern willow flycatcher, yellow-billed cuckoo, loach minnow, spikedace, Gila chub, Gila topminnow, desert pupfish, razorback sucker, Huachuca spring snail, Huachuca water umbel, Huachuca tiger salamander, and Canelo Hills ladies' tresses. • In recognition of its biological importance, the American Bird Conservancy picked the San Pedro as its first "Globally Important Bird Area," and The Nature Conservancy deemed it one of the "Last Great Places" in the western hemisphere. In recognition of its unparalleled value, Congress created the San Pedro National Riparian Conservation Area in 1988, prohibiting livestock grazing, mining, water diversions, and off-road vehicles. The San Pedro was to be protected for posterity. The San Pedro is dying. Its aquifer is being sucked dry by growth in the Sierra Vista/Fort Huachuca area. In fact the river went dry for the first time on record on July 5, 2005, and remained dry for 8 days. The river is predicted to go dry again in 2006 unless rains move in and mask the loss of baseflows. If nothing is done, the San Pedro will join dozens of our rivers, such as the Santa Cruz, which have become dry washes in the last 100 years. Arizona's last wild river will be gone. "This seems to be a sign that you can't keep mining the aquifer as if nothing was going on." Help us Save the San Pedro River! Protecting the Last Wild River. The Center for Biological Diversity has filed endangered species petitions and lawsuits on behalf of the San Pedro's most endangered plants and animals. We are now working to get the Cochise County Board of Supervisors and the city managers of Sierra Vista to adopt planning regulations that will ensure the river's survival. Thus far, they have been unwilling to face the reality that growth is likely to kill the river. Call your Congressperson, members of the Cochise County Board of Supervisors, and Sierra Vista City Council. Tell them the San Pedro cannot support growth in the Sierra Vista/Fort Huachuca area... it's already in a state of biological emergency. Tell them why you care about the Southwest's only free flowing river. Tell them to decrease the size of Fort Huachuca and adopt a zero growth plan for Sierra Vista/Fort Huachuca area that will allow the river to continue to provide North America with its treasure of biological diversity. Phone and write your newspaper immediately. Ask the editor to write an editorial against Sierra Vista's expansion. Also write your own letter to the editor. Join the Center for Biological Diversity, along with thousands of others who oppose signing the death warrant of Arizona's native wildlife which depend on the San Pedro for their survival. We'll make sure your voice is heard.